The monastery Kapuzinerkloster and Kapuzinerkirche church are located on a mountain facing the old town: the Kapuzinerberg mountain, named after the abbey. There are two scenic routes leading to it: via the Imbergstiege off Steingasse and the romantic St. Johannes Church; this little church that is often missed by visitors is on one of Salzburg′s most picturesque spots and was recorded for the first time in the early 14th century. It was extended and decorated in Baroque style under Prince Archbishop Max Gandolf. "Imberg" was the former name of the Kapuzinerberg. The other route goes via the "Prügelweg", the passion path starting from Linzergasse 14. Alongside this steep route, you find parts of the old city walls as well as six chapels displaying scenes from the passion of Christ. The passion path ends with a group of crucifixes just in front of the Zweig Villa, the former residence of Stefan Zweig. A memorial to the right hand side of the main entrance to the Kapuziner Abbey reminds of the writer who committed suicide after fleeing from the Nazis. 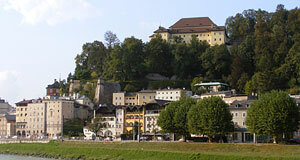 Prince Archbishop Wolf Dietrich von Raitenau built the Kapuziner Abbey and church to accommodate the monks of the Kapuziner order, when he called them into Salzburg in 1594. The buildings were erected on the site of the "Trompeterschlössel" ("trumpeter castle"). The northern wall of the Kapuziner Church is the only remain of this castle. According to the rules of the order, the building is plain and without major decorations. The interiors are mostly from the 17th and 18th century. The wood-carved front gate is in Gothic style and was previously used in the old cathedral. The main altar dates back to the early 18th century, the central altar painting depicts the adoration of the magi by the shepherds and was painted in 1602. Slightly below the abbey you find a platform that will provide you with a stunning view over the old town and the Festungsberg with the fortress Hohensalzburg. This platform is called "Hettweber-Bastei". It is a good starting point for longer strolls along the Kapuzinerberg, where you will find the scenic "Franzinkischlössl" (Francis castle), many remaining parts of the city walls and a unique flora and fauna due to the position of the mountain during the last ice-age: it pointed out of the glaciers that covered the Salzburg valley like an island, providing a biotope for many endemic species that survive until today.